The Passover of the Jews was near, and Jesus went up to Jerusalem. And He found in the temple those who were selling oxen and sheep and doves, and the money changers seated at their tables. And He made a scourge of cords, and drove them all out of the temple, with the sheep and the oxen; and He poured out the coins of the money changers and overturned their tables; and to those who were selling the doves He said, “Take these things away; stop making My Father’s house a place of business.” (John 2:13-16). Money-changers in Jerusalem. Photo by Leon Mauldin. bankers who exchanged one nation’s currency, or one size of coin, for another. These people provided a convenience, charging a fee (often exorbitant) for their services. 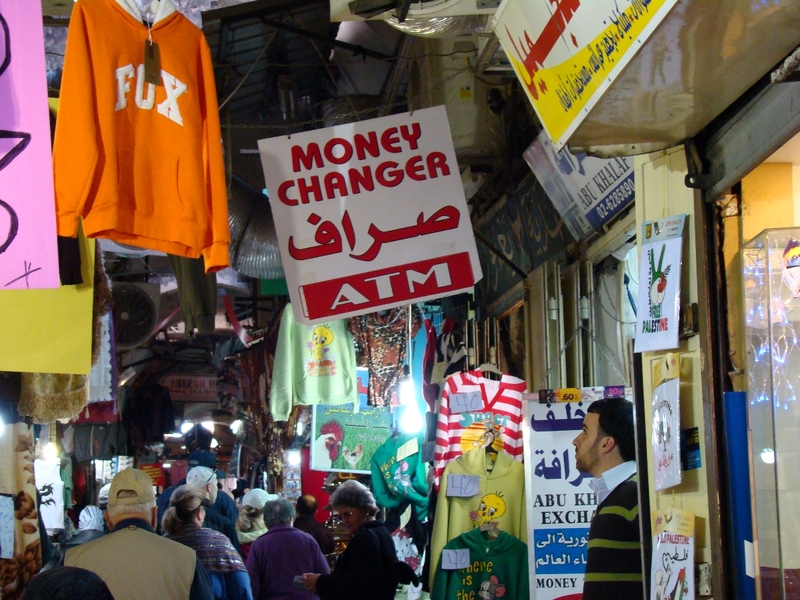 Some moneychangers operated in the temple area (the Court of the Gentiles), because all money given to the Temple had to be in the Tyrian silver coin. According to Exodus 30:11–16, every Israelite 20 years old or older was required to pay an annual tax of a half-shekel into the treasury of the sanctuary (Nelson’s New Illustrated Bible Dictionary). Note the location is the hieros (temple area with its spacious courts, John 2:14-15) and not the naos, or sanctuary, where only the priests could go. What do you think Jesus might do if He were to walk among “modern churches” today? (I know the church in the biblical sense is not the physical church building/meeting place, but rather is the people of God). This entry was posted on Wednesday, February 10th, 2016 at 11:08 AM and is filed under Bible History and Geography, Bible Study, Biblical Interpretation, Israel, Jerusalem, New Testament, photography, Travel. You can follow any responses to this entry through the RSS 2.0 feed. You can leave a response, or trackback from your own site. Every time I travel to Mexico or some other Spanish speaking country, I think about looking for the best rate of exchange. Usually I can find a better rate in the streets than the official bank rates. It never ceases to amaze me that churches could be more opportunistic than the worldly.